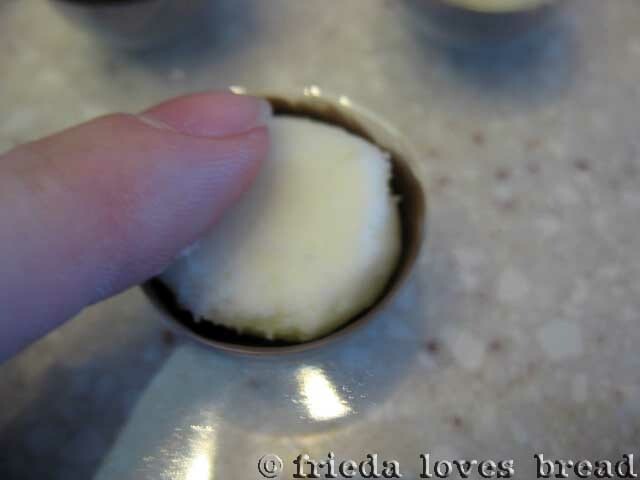 Frieda Loves Bread: Easy Mint and Assorted Chocolates! 5 Easy Mint and Assorted Chocolates! 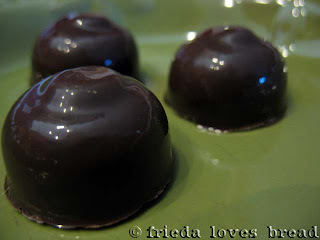 I made these ultra soft, minty, melt-in-your-mouth mint chocolates for Christmas. 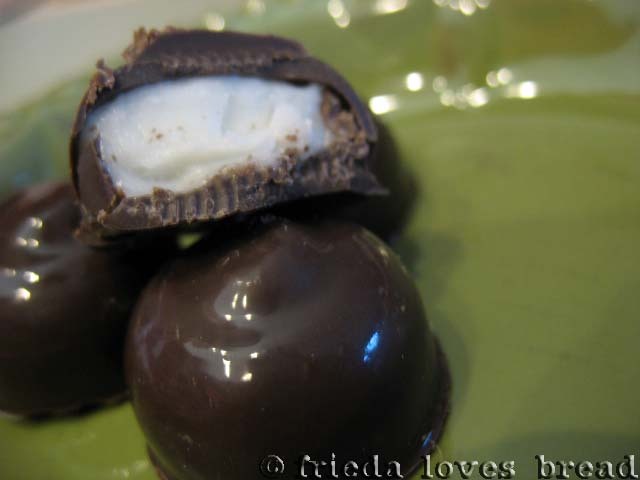 Valentine's Day is right around the corner, so why not make these? 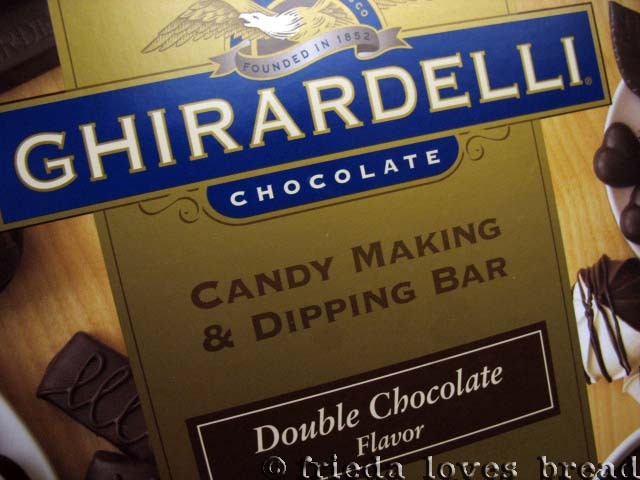 This is the chocolate that I used. I think it came from Costco, but you can find it HERE. This chocolate has a dark, semi-sweet flavor that is perfect with these easy mint fondant centers. 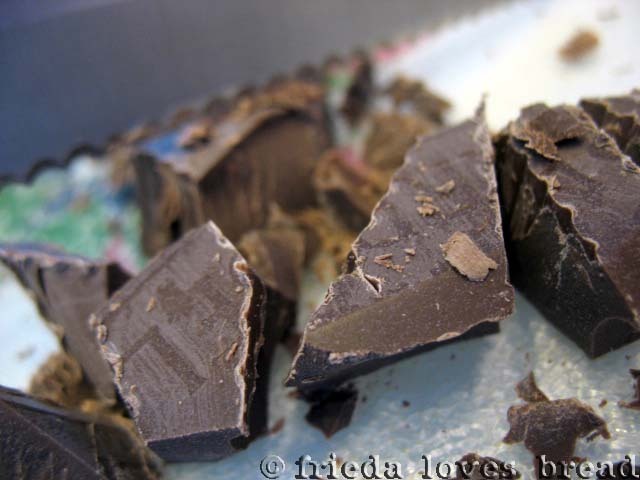 The large chocolate bar is cut into smaller pieces with a serrated knife. 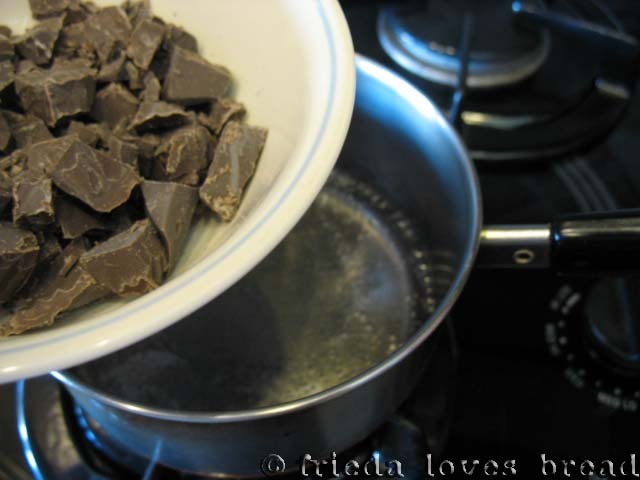 Then put into a double boiler, or in my case, a bowl over a pot of simmering water. The water must be simmering, not boiling. 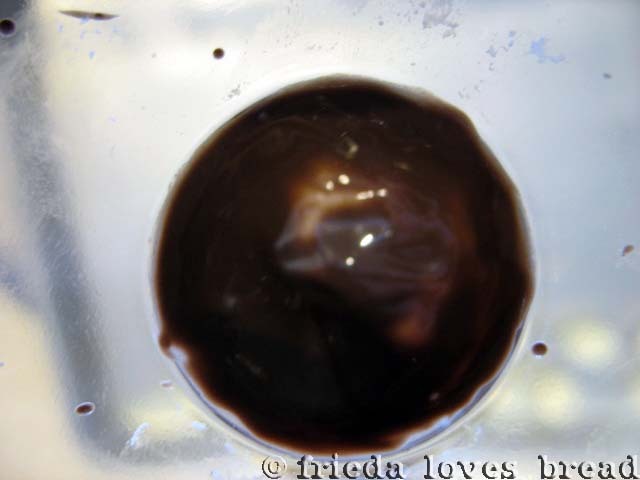 If any steam or droplets of water get into your chocolate, it will seize, turn hard and grainy. If it seizes, you will have to add warm water, melted butter, cream or other liquid and use it for another recipe, such as frosting. 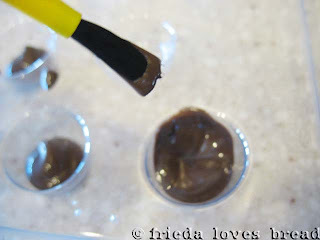 It will not work for dipping or molding chocolates. 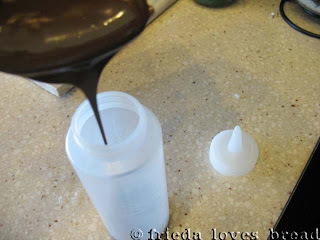 Once the chocolate has melted, it is poured into a plastic squeeze bottle. To keep the chocolate warm and melted, the bottle is put onto a heating pad set at LOW. Notice that the cover of the heating pad has been removed for easier cleaning! You can find all sorts of candy/chocolate molds HERE. I've seen them at Joann's Fabric Store, Orson Gygi, Sandy Bosch Kitchen Center for $2 per mold. Squirt a little bit of chocolate into the mold. Pop the painted mold into the freezer for a minute. It only takes a minute, no longer! Take the mold out and fill it with your rolled fondant by gently pressing each into the mold. Make sure you can see the TOP EDGE of the chocolate...don't cover it with the fondant. Pop these into the freezer again for a minute or two. 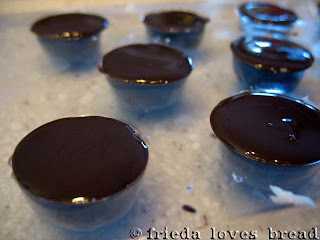 The tops should be firm and dry and you should be able to "pop" the candies out like little ice cubes. If they don't come out easily, they'll need another minute or two in the freezer. Look how perfect they are! I've hand dipped chocolates before and while licking chocolate covered hands is fun, molding chocolates is waaaaay easier! Here's my assortment of chocolates: Peanut Butter Cups, Maple Pecan, Pina Colada Coconut, Chocolate Truffle and of course, the Mint and the Peanut Caramel Squares. I purchased the boxes at Orson Gygi and found the snowflake wrap at the dollar store. See the "M" on one of the chocolates? That's the Maple Pecan. 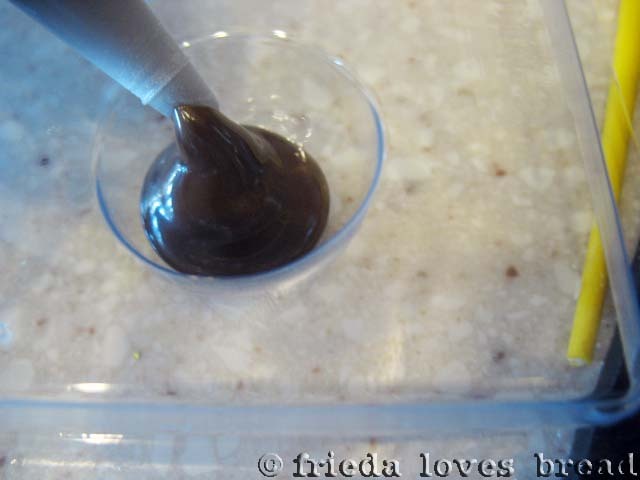 I molded it in milk chocolate and used dark chocolate from a squeeze bottle to make the letter on top. 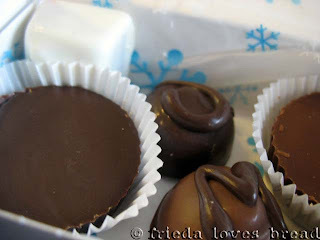 A box of homemade chocolates. I can't think of a better gift! 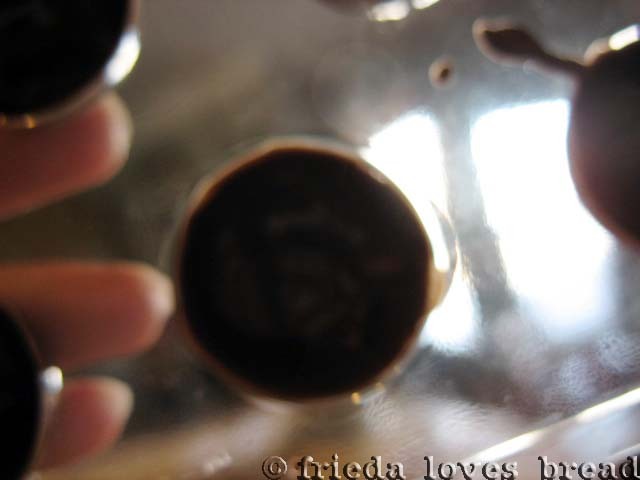 I love the shine on the chocolate. It's tempered perfectly. Thanks, Bonnie! I didn't even temper this chocolate ~ the mold provided the shine! The chocolates look yummy! These would be a lovely gift for Valentine's Day. You made this look so easy. 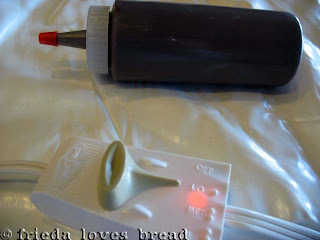 I've got to try it. Chocolate mint is my favorite. So is maple pecan. 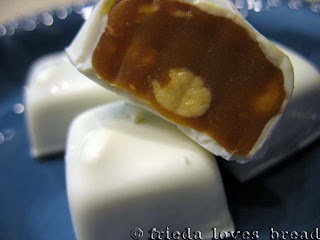 Hopefully your homemade chocolates will save me tons of money over my See's excursions. Frieda, the chocolates you gave Julie and I - well they were amazing! I definitely want to try these!! !